S3’s MetaForm engineering design, perfected over a 20 year period, creates a highly modular, and cost effective framework for combining multiple wafer finishing processes in a single photolithographic processing tool. This integration presents a number of advantages to the wafer fab engineer. Less interruption of workflow, with less handling. Lower total equipment cost/wafer due to the higher integration. No need to purchase separate tools for coat and develop. Coordinated multi-process control from a single programmable system means higher reliability and fewer points of failure. More wafer finishing processes taking up less floor space in your fab. Faster overall throughput due to the integration of the process conditions and no need for manual reload. 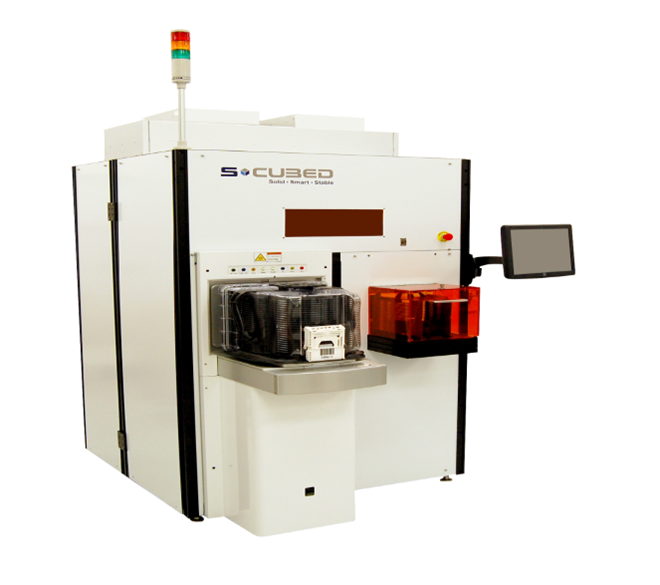 Integrated Wafer Edge Exposure By S-Cubed. All of the capabilities available in our stand alone WEE are available in the WEE module integrated within either a coater subsystem, a developer subsystem or a combination coater-developer system. The processing system can be linked to a stepper or operate independently as a simple configuration option. Furthermore, the WEE can be programmed to “protect” regions on the wafer from etch processes by “painting” light on those regions requiring protection or not doing so depending upon the resist tone. All of these advantages are achievable with virtually no additional footprint and very low additional cost. All of the performance specifications that apply to the stand-alone WEE system are maintained for the integrated system as well. For more information on our integrated Wafer Edge Exposure – Coater – Developer systems please contact our engineering team today.